JoeA's LINQPad is an indispensible tool for LINQ development. Write a query expression and view the results, the generated SQL, and the extension method / lambda equivalent. Works for both C# and VB! Locate the shortcut for SQL Management Studio on your Start Menu and move it some place else. In its place, insert a shortcut to LINQPad. 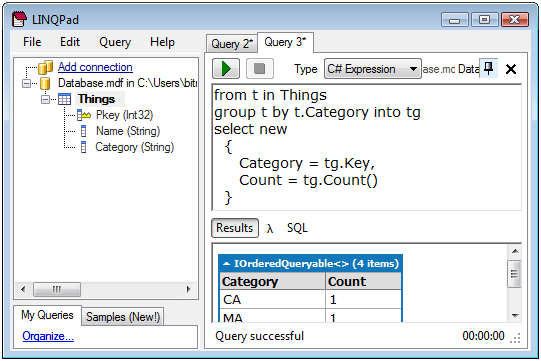 For the next week, perform all your ad-hoc SQL queries using only LINQPad. Teachers say language immersion is highly effective when learning a new language. I'm sure the LINQPad challenge is a worthwhile endeavor to learn the subtleties of LINQ. Yes LINQPAD is very very helpful in learning LINQ. Awesome tool. Thanks for passing along the info!